Hello, I don't have a new review, unfortunetly, but hopefully I will find a new book worthy to be in my hands. So, keep checking back, because I will check in and probably ramble about stuff like how amazing the top twenty on So You Think You Can Dance? is. Well, it is. Can't wait for tomorrow to finally get to the performance shows. Now, I could go on, even using technical terms because I am a dancer, but I will spare all of you reading, so I'll stop. Everyone enjoy the last few weeks of school and the nation-wide heat wave. Well, I have 3 school days left until I am out for summer and then I promise there will be a bunch of book reviews. If anyone has a request or reccomendation for my summer reading, leave a comment. And once again thank you to all of you, and I can now say I believe I did well on my exams. Only one more!! Thanks! The Friday Night Knitting Club explores how an art can bring generations together. It tells the stories of the women of the Friday Night Knitting Club and the woman who runs it, Georgia Walker. Georgia is a single mom with a twelve year old daughter, Dakota. Georgia hadn't had any problems with Dakota until Dakota's father, James, shows up wanting to be part of his daughter's life. Georgia runs a yarn shop called Walker and Daughter, which is where the knitting club takes place. The club is made up of a cast of colorful characters. Anita, a seventy something year old who has made Georgia and Dakota her surrogate daughter and granddaughter. Perri, a student who works part time at the shop. Darwin, a grad student in women's studies, with almost no people skills. And many other characters which you will have fallen in love with by the end. This story is one of the most moving pieces I have read in a while, and I wish Walker and Daughter were real. I highly recommend you pick up a copy and read it as soon as possible! So I am back, and tomorrow is my birthday! So I would like to thank all of you who asked how my exams went, well I can tell you soon, they start tomorrow. I have been busy studying for the past few weeks. I have also had dance rehersals so I don't know when I had time to actually start and finish a book, but I did. So the review will come when I get home tomorrow from my History exam. 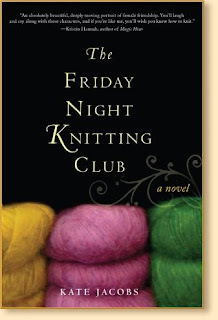 I will tell you the book- The Friday Night Knitting Club. For those of you taking/taken finals good luck!